In 1918, Takagi  performed the initial arthroscopic procedures on cadaveric knee specimens. Foot and ankle arthroscopy was not thought possible at that time because of the large size of the cystoscopes, measuring 7.3 mm in diameter. In 1931, Burman  performed the first ankle arthoscopy with the use of a 3.5 mm arthroscope; nevertheless, he felt that the joint was not well suited to arthroscopic techniques, due to the narrow joint space. Takagi , in 1939, showed excellent results in his series of ankle arthroscopy, and is credited with developing the techniques and standard portals used today. There have been dramatic advances in the use of arthroscopy of the rearfoot and ankle in the previous fifteen years. Several authors are responsible for the advancement of arthroscopic techniques. Guhl and Ferkel [3,4] developed new techniques for the treatment of subtalar pathology, including resection of the os peroneum. Ferkel  is also credited with being an originator of the retrograde approach to talar lesions. Oloff [6,7] has published articles documenting the use of arthroscopic techniques in the treatment of calcaneo-cuboid pathology, and the use of capsular shrinkage of the ankle as an option to traditional lateral ankle stabilization techniques. Today, arthroscopy of the rearfoot and ankle joint is commonplace, with new techniques and treatments developing continually. Arthroscopy is commonly used in the rearfoot and ankle for the treatment of soft-tissue disorders such as instability, synovitis, impingement, arthrofibrosis, and generalized pain of unex- plained etiology. With the advent of small-joint arthroscopic equipment and improved diagnostic studies, it is now possible to evaluate and treat small joints with minimal trauma and rapid recovery. The purpose of this article is to introduce arthroscopic procedures of the ankle, and their possible uses in the treatment of rearfoot and ankle soft-tissue pathology. Although bony pathology of rearfoot and ankle joint may be treated well with arthroscopic techniques, it is beyond the scope of this chapter. Thorough examination of the ankle joint is necessary to limit the chance of missing a possible cause for pain. General visualization of the ankle joint for swelling and deformity is done before examination. I begin my examination on the medial ankle, as this is the less commonly involved region of ankle-joint pain. A valgus stress and anterior drawer are placed on the ankle, and the continuity of the deltoid ligament is checked. Palpation of the medial bend and medial gutter will often instigate pain in cases of soft-tissue impingement or synovitis. Direct palpation of the deltoid ligament will also present with pain in cases of possible partial or complete tear. Examination then shifts to the anterior ankle. Range of motion in both dorsiflexion and plantarflexion are done, as is palpation of anterior joint line for pain. With diffuse synovitis, there is often chronic swelling and pain along the entire anterior ankle joint. The lateral ankle is the last region examined, as it is the most often symptomatic. Examination for swelling and erythema is done before palpation. Often in cases of chronic lateral ankle instability, there is a diffuse swelling of the lateral ankle extending along the anterior and plantar surfaces of the fibula. The anterior drawer and varus tilt tests are then performed. With instability, there may be a dimpling of the anterior lateral ankle region, consistent with partial or complete anterior talofibular ligament (ATFL) tear. Finally, palpation of the anterolateral and lateral ankle is done. Direct pain over the ATFL is often present in cases of both acute and chronic rupture of the ligament, yet may be absent in chronic cases. Pain in the lateral bend of the ankle is associated with lateral impingement lesions, often secondary to talar dome lesions or severe ankle sprain. Pain plantar to the fibula may correlate with calcaneofibular ligament (CFL) sprain or tear. Although the majority of ankle symptoms are in the anterior compartment, the posterior ankle should also be examined. Pain with palpation of the medial or lateral aspects of the posterior ankle may be due to synovitis, talar dome lesion, or loose bodies. With direct pressure on these regions, pain is often elicited. Following thorough examination of the ankle joint, diagnostic studies are done to complete a suspected diagnosis. The appropriate diagnostic study is essential to a working diagnosis, and depends on the suspected cause of pain. Standard radiographs are done to check ankle position and alignment. Also, arthritic changes to the ankle, suspected talar dome lesions, and anterior ankle spurring are all visualized. Soft-tissue disorders are best visualized with magnetic resonance imaging (MRI). MRI is excellent for location and identification of both medial and lateral ligament tears, either complete or partial. Soft-tissue lesions and generalized visualization of synovitis are also possible. However, MRI use is limited, because the films must be read by a radiologist experienced in foot and ankle ailments. I find that I often note regions on the MRI that are missed by the radiologist; therefore, I review all MRI films to limit the chance of a false negative reading. If MRI is not available or is limited due to the presence of internal hardware, ultrasound can be used to diagnose soft-tissue lesions within the ankle joint. In the case of lateral or medial ankle instability, my first choice of examination is a stress ankle series. This is done in comparison with the contralateral ankle, unless the second ankle is also symptomatic. Schon et al  concluded that a greater than 4 mm anterior subluxation of the talus on the tibia, when compared with the contralateral, uninvolved, extremity, indicated an ATFL tear. Further- more, Perlman et al  concluded that a stress anterior drawer of greater than 18 mm, when compared with the contralateral ankle, indicates severe laxity, with possible involvement of both the ATFL and the CFL ligaments. Of all the joints in the hindfoot complex, the painful ankle presently holds the greatest potential for arthroscopic treatment. Soft-tissue lesions of the ankle are commonly located in the anterior aspect, and may be treated with a great deal of success and minimal trauma to the ankle joint. The use of distraction is often not necessary in the treatment of soft-tissue lesions of the ankle joint. If there is concern of intra-articular pathology between the tibiotalar joint, use of a non- invasive ankle distractor provides adequate distraction. The most common instruments used in the ankle joint are the 4.0 mm or 2.7 mm, 30-degree arthroscopes. Although a 70-degree angled scope may be used to treat medial and lateral gutter pathology, there is very limited use for this degree of angulation, and with proper technique, the 30-degree arthroscope will visualize all the regions of the ankle joint. Due to the increased inflow and larger visual field, I prefer the 4.0 millimeter arthroscope for anterior ankle pathology. It is essential to create proper portal position before starting the procedure. If there is a question of portal placement, fluoroscopy may be used to establish ideal portals. The ideal portal is one that allows access to the gutter associated with that portal, and also allows for easy visualization of the dome of the talus and the contralateral gutter. Once portal position has been established, a thorough examination of the ankle joint is performed. Ferkel  established a 21-point examination of the ankle joint. Since the majority of soft-tissue pathology is within the anterior ankle joint, the major focus of the 21-point examination is placed on the eight-point anterior ankle examination. The eight points are the deltoid ligament, medial gutter, medial talus, central talus, lateral talus, talofibular articulation, lateral gutter, and anterior gutter. Through this sweeping examina- tion, a general assessment of the ankle joint is performed. Synovitis is the inflammation of the synovial lining of a joint or tendon sheath. Synovitis of the ankle joint may be secondary to multiple causes, including biomechanical factors, soft-tissue injury, osseous pathology, or degenerative arthritis. Furthermore, synovitis of the ankle joint may be secondary to a systemic disease such as rheumatoid arthritis. Synovitis is often characterized by generalized swelling of the ankle joint, with or without associated pain. There is often a feeling of soreness within the joint, which is either constant or periodic with certain activities. In the case of chronic and prolonged pain not responding to conservative care, arthroscopic debridement of the ankle joint may be done with excellent results. Often, the irritating factors may be identified and treated with arthroscopy. There is usually an underlying cause to the synovitis, such as capsular adhesions, soft-tissue impingement, instability of the joint, or primary osseous factors. My most common finding during arthroscopic debridement of the painful ankle has been soft-tissue impingement of the ankle joint. Soft-tissue impinge- ment is often secondary to ankle trauma, such as a ligament sprain. A second common source of impingement lesions is an intra-articular fracture of the ankle, with subsequent adhesive capsulitis or adhesions within the joint space. Finally, chronic biomechanical irritation of the ankle joint may cause impingement lesions (e.g., meniscoid lesion) of the medial or lateral bend of the talus. Often, a meniscoid lesion forms in the lateral aspect of the ankle joint secondary to trauma. This lesion may develop as a result of subtle chronic trauma, such as poor ankle-to-foot alignment, with chronic stress on the lateral bend of the tibia, or from an acute episode, such as a severe ankle sprain. The ultimate result is chronic pain associated with hyalinized soft tissue or synovium in the region of injury. Several structures are involved in chronic ankle impingement. These include the anterior talofibular ligament (ATFL), the anterior inferior tibio-fibular ligament (AITFL) and the deltoid ligament [11–13]. The most common of these lesions is a thickening of the ATFL, with associated involvement of the surrounding synovium and joint capsule in the region of the anterior talo-fibular ligament. This lesion often develops after an inversion sprain and may be a thickening of the scar tissue formed during the healing period following an ankle sprain. Bassett  described an impingement lesion involving a thickening of the inferior aspect of the anterior inferior tibio-fibular ligament. This thickening was found to be a normal variant in certain cases; however, a severe thickening of the plantar aspect of the ligament was found to cause pain associated with an anterior impingement within the ankle joint. Waller  also considered the associated symptoms of chronic repetitive inversion injuries. He termed his findings ‘‘anterolateral compression syndrome,’’ which included chronic synovitis, fibrosis, chondromalacia, and meniscoid bands of the lateral gutter. Ferkel  showed 84% relief in patients with chronic anterolateral gutter pain following arthroscopic debridement. His diagnoses included synovitis and fibrosis of the anterolateral gutter, inflamed capsule, and inflammation or fibrosis of the antero-lateral ligamentous tissue. While many of the soft-tissue lesions discussed above are found in chronic situations without a known cause, in my experience, most soft-tissue lesions within the ankle are caused by lateral ankle instability. I have found that many soft-tissue lesions are due to a hypermobility of the ankle joint or poorly treated instability of the ankle joint. Often, an arthroscopic debridement of the ankle joint is done before an open lateral ankle ligament reconstruction. Although several arthroscopic lateral ankle stabilizations have been documented, none has been easy to master or has had a rate of success comparable to that of open procedures [16–18]. Oloff et al. reported the use of a monopolar radiofrequency thermal stabilization for stabilization of chronic lateral ankle instability. This procedure was originally used in the shoulder joint. Successful use of capsular shrinkage in the treatment of chronic anterior instability of the glenohumeral joint has been reported in the literature . Hayashi  found that the application of heat to connective tissue caused a linear reduction in collagen cross-linking, which resulted in shortening of the associated structure. A shrinkage of greater than 50% of the original length of the associated structure was possible. Naseef and Oloff [7,21] found that the same theories studied in animal tissue and other joints of the human body could be used to treat instability of the ankle joint. Oloff  presented his results of 16 consecutive cases, ten of which were included in the study. The results of ankle varus stress test results decreased an average of 2.8 degrees, while anterior drawer reduced by an average of 4.8 mm. All patients achieved ankle stability, and commented that they would choose to undergo the procedure again if given the opportunity. The painful ankle is difficult to thoroughly examine and differentiate the source of symptoms. Often, the source of pain may be secondary to an underlying injury or a chronic micro-trauma. Normally, if a patient presents with ankle pain, the initial examination will provide the necessary information to build a differential diagnosis. If the soft-tissue structures within the ankle are a consideration, the differential diagnosis will often include lateral ankle insta- bility, soft-tissue impingement, synovitis, ligament tear (both medial and lateral), and adhesive capsulitis or meniscoid lesion. An MRI study is often ordered to further differentiate possible etiologies of pain. Based on the MRI findings, stress radiographs may be ordered. The stress radiographs are used to further diagnose lateral ankle instability or medial deltoid tear. In the case of medial deltoid rupture, however, there is often enough information from the examina- tion and MRI findings to diagnose the problem, and the ligament is repaired through an open procedure. If stress inversion and anterior drawer tests indicate lateral ankle instability, the patient is informed that this this is a potential source of his pain. Before the surgical treatment of the painful ankle, a course of conservative care is undertaken, including physical therapy, proprioception, and strengthening activities. Often, a three- to four-week course of physical therapy and guarded ambulation in an ankle brace reduces the acute symptoms associated with the chronic ankle deformity, and allows for better assessment of the underlying problem. If conservative care does not fully resolve symptoms, arthroscopic exploration and treatment is undertaken. MRI findings at the time of arthroscopic treatment of ankle soft-tissue deformities often include loose bodies in the anterior joint space, medial, and lateral gutter. These loose bodies will lead to associated soft-tissue swelling and joint synovitis. Further MRI findings may include a rupture, complete or incomplete, of the ATFL or CFL ligaments. Anterior soft-tissue lesions at the medial or lateral bend of the talus is a difficult clinical finding to associate with MRI results. These soft-tissue lesions are often associated with a history of lateral ankle instability, chronic ankle sprains, or fibrous band formation due to ankle trauma or mechanical dysfunction. MRI findings will often only show a generalized increased signal intensity in the anterior ankle in relation to these soft-tissue symptoms. Therefore, a correlation of MRI findings with clinical examination denoting pain in the anterior ankle should be treated as synovitis and possible fibrous tissue formation. The comprehensive arthroscopic treatment of the ankle requires the consent of the patient for several possible procedures, in order to allow the surgeon to perform all aspects of the surgery. The treatments of soft-tissue lesions, synovitis, fibrous bands, and adhesive capsulitis are standard in all arthroscopy cases. However, it may be necessary to address damage to the cartilage or bone within the ankle during surgery. Furthermore, instability of the ankle joint may need to be treated, either through an arthrotomy or arthroscopically. For these factors to be treated, the patient needs to be fully aware of the possibility of casting and non-weight bearing following surgery. It is possible that the treatment plan may change at the time of surgery, and a planned synovectomy may actually require correction of concurrent cartilage deformity or lateral ankle instability. However, through a proper pre-operative work-up, the patient can be fully informed of the treatment planned at the time of surgery and the post- operative requirements of surgery. The actual surgery is often performed under local anesthesia, such as an ankle block or a popliteal fossa block combined with sedation. A second option is general anesthesia. A non-invasive distractor should be available in case of articular damage or soft-tissue lesions of the posterior aspect of the joint; however, the soft-tissue ailments of the anterior ankle and the gutters can be treated without the use of distraction. A 4.0 mm or 2.7 mm arthroscope is used, depending on the size of the ankle and region to be treated. I prefer a 2.7 mm arthroscope in cases of medial or lateral gutter involvement in a small ankle joint. Otherwise, I prefer the 4.0 mm arthoscope, due to its better resolution, higher picture quality, and better ingress of fluid. The ankle is entered through a medial incision to the anterior tibial tendon. In cases of generalized synovitis and planned synovectomy, it is easier to place the arthroscope at the level of the ankle joint. If treatment of the medial or lateral gutter is planned, the arthroscope portal on the contralateral side of the proposed treatment site is placed slightly proximal, in order to easily cross the anterior ankle without impingement on the neck of the talus. Once the joint has been entered with the arthroscope on the medial aspect, an 18 gauge needle is placed over the lateral portal site through direct illumination via the arthoscope. The needle is used as an egress site for fluid during the examination portion of the procedure. In certain cases of heavy synovitis in the anterior joint line, poor visualization associated with the excess fibrous and synovitic tissue makes it impossible to examine the joint. In that case, the examination portion of the procedure is done once the excess tissue is removed with a full-radius shaver. The examination of the ankle joint is from medial to lateral. The medial gutter, medial bend, and medial talar dome are first examined. Next, the anterior talus, the lateral talus, lateral bend, and lateral gutter are examined. Finally, the anterior gutter, lateral collateral, and deltoid ligaments are examined. Before any form of deformity treatment, a synovectomy, removal of all fibrous adhesive bands, and removal of any soft-tissue impingement lesions are performed. These procedures are best done with a full-radius shaver in conjunction with arthroscopic ronguers and different suction or basket punches. This is often a tedious procedure unrelated to the primary cause of the chronic ankle pain. However, the pain associated with these secondary factors is often greater than the pain associated with the injury. A full debridement will allow for proper visualization of the ankle joint and better understanding of the underlying injury. Following a complete debridement, the ankle is again checked. The medial deltoid and lateral ankle are the primary spots of examination. If there is any question of a possible talar dome lesion or cartilage damage, the region of the lesion is routinely checked. A common finding in the region of cartilage damage or a talar dome lesion is an abundance of synovitis and fibrous tissue formation. Therefore, it is essential to check the talar dome if a large amount of synovitis is found at the medial or lateral bend of the talus. The ligamentous examination of the lateral ankle will often provide much information to the arthoscopist at the time of surgery. I have found it very helpful in the diagnosis of lateral ankle instability to have an assistant perform an anterior drawer examination while I hold the arthroscope at the lateral bend of the ankle joint. While the drawer test is being done, I can observe the movement of the talus anterior to the tibia. A second diagnostic test is to place the arthroscope in the antero-lateral gutter and have an assistant perform an eversion test. Often, in the case of lateral ankle instability, there is an outpouching of the lateral capsule. If the above tests correlate well with radiographic stress examination and MRI findings, a thermal capsular shrinkage is done. The capsular shrinkage is done with an Oratek heating probe (Oratek Interventions, Inc. Menlo Park, CA). The general temperature readings at the time of surgery are between 65 and 75°C, and the power setting is between 25 and 45 watts. The procedure is begun at the lowest settings, and the tempera- ture and wattage are increased until there is a bubbling at the tip of the heating probe and associated shrinkage of the casulo-ligamentous region. It is essential not to overheat the capsule, as this will cause a degeneration of the fibrous nature of the capsule and result in poor healing. The probe best suited for capsular shrinkage is the ‘‘Tac-S’’ type. The thermal capsular shrinkage procedure starts with placement of the arthoscope in the antero-lateral gutter on the dorsal aspect of the talar neck. Although a 70 degree arthroscope may be used, it is generally unnecessary, and a 30 degree angle arthroscope is sufficient. It is essential that the medial portal be placed slightly proximal on the medial side, in order to easily cross the anterior ankle. The heating probe is then placed in the lateral gutter through the standard lateral portal. In a large ankle, the probe sometimes cannot reach the most inferior aspect of the ankle capsule on the lateral side of the joint. In that case, an accessory lateral portal is established slightly inferior to the standard portal. The procedure is performed while an assistant holds the foot in a fully everted position. The heating probe is placed in the most posterior portion of the lateral gutter and a sweeping motion of the lateral gutter is undertaken. The probe is swept from a superior to inferior position like a wand. As the tissue begins to react, there is an associated shrinkage, and the probe is moved anteriorly. This anterior motion is performed along the entire lateral aspect of the ankle to the antero-lateral aspect of the joint. Special attention is paid to the ATFL, which is also shrunk. Care is taken not to overheat the ligament on the anterior capsule, in order to avoid damage to the anterior sensory nerves. The ankle is continuously checked for stability. Although a dramatic increase in stability is desired, the same level of stability as in an open procedure is not necessary at the time of surgery. With cast immobilization of the heat-treated tissue, there is an alteration in the fibrous nature of the capsule and ligament, resulting in increased ankle stability (Fig. 4A–D). Once the shrinkage is completed, the portal sites are closed with non- absorbable suture, and the patient is placed in a padded, non-weight bearing, below-the-knee cast. The cast must be well molded in the region of the ankle, holding the foot and ankle in an everted position. Weight bearing is not permitted for three weeks following surgery. A gradual increase in weight bearing in a below-the-knee cast is undertaken over the course of the next seven to ten days. The cast is removed at five weeks, the patient is placed in a removable below-the- knee walking boot, and physical therapy is started. I prefer that the patient wear an ankle brace during physical therapy for two to three weeks, and limit the therapy to dorsiflexion and plantarflexion exercises only. The patient is moved to an ankle brace at six weeks post surgery and a complete physical therapy program is undertaken for an addition two to three weeks. The ankle brace is to be worn at all times for one to two months post surgery, and during sports activity for six months post surgery. Instability of the ankle joint is a complex problem associated with several potential underlying causes of pain. The common ankle sprain is often treated without much concern for possible future instability. It is important to remember that, as the talus dislocates anteriorly, it tears the antero-lateral ligamentous structures and joint capsule. Furthermore, angulation of the talus on the tibia can cause damage to the cartilage surfaces of the tibia, the talus, or both. I believe that the proper terminology for an ‘‘ankle sprain’’ should be a partial dislocation of the talus. With enough force in the plane of a common ankle sprain, there is either a complete dislocation of the talus, or a fracture of the supporting osseous structures. Therefore, an ankle sprain must be treated with the same level of care and consideration given to partial dislocations of other joints in the body. Several articles have shown the benefits of conservative care for acute lateral ankle injuries, with results comparable to acute lateral ankle stabilization [22–28]. If the care of ankle trauma is not properly handled, multiple secondary causes of pain may occur. These include adhesive capsulitis, synovitis, fibrous band formation, meniscoid lesions, and chronic ankle instability. Chronic ankle instability has been the source of a great deal of debate and many differing surgical options, including delayed primary ligament repair and ligament reconstruction with tendon grafting [9,23,24,28–37]. Several arthroscopic liga- ment repairs have been presented [16–18,38]. All of the arthroscopic procedures required the use of anchoring devices, and the surgeon was essentially perform- ing an arthroscopically assisted Brostro ̈m procedure. Yet, only stability in the plane of the ATFL ligament was achieved. Thermal capsular shrinkage of the lateral capsulo-ligamentous complex allows for shrinkage of the entire lateral capsule from posterior to the fibula to the ATFL ligament region. Stability is achieved mainly in the plane of the ATFL, yet some stability in the plane of the CFL is also possible as the lateral joint capsule is shrunk. Naseef  showed a 60% decrease in capsular length in his experimental studies using thermal capsular shrinkage. Oloff  also showed a 55% decrease in anterior stress test instability measurements following thermal capsular shrinkage. Thermal capsular shrinkage is not the ideal procedure for all lateral ankle instability cases. The surgeon needs to be sure that there is not a severe laxity involving several ligaments or underlying connective tissue disorder. Thermal capsular shrinkage is mainly to be substituted in cases of mild to moderate lateral ankle instability for which a Brostro ̈m procedure is being considered. Although stability in the plane of the calcaneo-fibular ligament may be achieved, if there is doubt about the function and integrity of this ligament, an open Brostro ̈m procedure may be a better option. Although subtalar instability may also be treated with the thermal probe, the procedure is not well tested and still under review. Therefore, if an ankle and subtalar joint instability coexist, the thermal capsular shrinkage procedure is not ideal. The comprehensive arthroscopic treatment of ankle pain is an ideal initial treatment potion in the painful ankle, mostly because the other associated ankle disorders, such as talar dome lesions, fibrous lesions, or impingement lesions, can be treated at the time of the stabilization. If the shrinkage is performed and the ankle is still found to be unstable, an open primary repair or tendon grafting procedure is a possible option. The open stabilization can be done at the time of arthroscopy or at a following sitting. Finally, the post-operative care of the shrinkage procedure is at least as important as the surgical procedure. The ankle needs to be held in an everted position for at least three weeks, followed by an increase in guarded motion for another three to four weeks to allow for healing of the shrunken tissue. With proper patient selection and peri-operative care, the thermal capsular shrinkage procedure is an ideal selection as part of a complete treatment of ankle instability and chronic ankle pain. Takagi K. The arthroscope. J Jpn Orthop Assoc 1939;14:359. Burman MS. Arthroscopy of direct visualization of joints: an experimental cadaver study. J Bone Joint Surg 1931;13:669–74. Ferkel RD, Scranton PE Jr. Current concepts review: arthroscopy of the ankle and foot. J Bone Joint Surg 1993;75A:1233–8. Guhl JF. New techniques for arthroscopic surgery of the ankle: preliminary report. Orthopedics 1986;9:261 – 4. Ferkel RD, Sgaglione NA. Arthroscopic treatment of osteochondral lesions of the talus: long-term results. Orthop Trans 1990;14:172–8. Oloff L, Schulhofer SD, Fanton G, et al. Arthroscopy of the calcaneocuboid and talonavicular joints. J Foot Ankle Surg 1996;35:101–12. Schon LC, Ozounian TJ. The ankle. In: Jahss MH, editor. 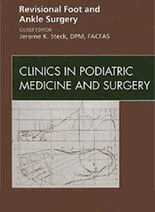 Disorders of the foot: medical and surgical management. Philadelphia: WB Saunders; 1991. p. 1435–41. Ferkel RD. Arthroscopy of the foot and ankle. New York: Lippincott-Raven; 1996. Bassett FH III, Gates HS III, Billys JB. Talar impingement by anteroinferior tibiofibular ligament. J Bone Joint Surg 1990;72A:55–7. Debardino TM, Arciero RA, Taylor DC. Arthroscopic treatment of soft-tissue impingement of the ankle in athletes. Arthroscopy 1997;13(4):492–8. Egol KA, Parisien JS. Impingement syndrome of the ankle caused by a medial meniscoid lesion. Arthroscopy 1997;13(4):522–5. Waller JF. Hindfoot and midfoot problems of the runner in symposium on the foot and leg. In: Mack RP, editor. Running sports. St Louis: Mosby-Year Book; 1982. p. 64–71. Ferkel RD, Karzel RP, Del Pizzo W, et al. Arthroscopic treatment of anterolateral impingement of the ankle. Am J of Sports 1991;19:440–7. Kashuk KB, Carbonell JA, Blum JA. Arthroscopic stabilization of the ankle. Clin Pod Med Surg 1997;14:459 – 78. Kashuk KB, Harmelin E, Holcombe R. et al. Arthroscopy of the ankle and subtalar joint. Clin Pod Med Surg 2000;17:55–79. Lundeen RO, Hawkins RB: Arthroscopic lateral ankle stabilization. J AM Podiatr Med Assoc 75:372 – 7. Thabit G, Thorpe W, Horne R, et. al. Treatment of unidirectional and multidirectional gleno- humeral instability by an arthoscopic holmium: YAG laser assisted capsular shift procedure. Laser application in arthroscopy. 1st Congress of International Musculoskeletal Laser Society, Neuchatel, Switzerland, September 1994. Hayashi K. Thabit G III, Massa K. et al: The effect of thermal heating on the length and histologic properties of the glenohumeral joint capsule. Am J Sports Med 1997;25:107–12. Naseef G, Foster T, Trauner K, et al. The thermal properties of bovine joint capsule. Am J Sports Med 1997;25:670–4. Avci S, Sßayh U. Comparison of the results of short-term and semi-rigid cast immobilization for the treatment of grade 3 inversion injuries of the ankle. Injury 1998;29(8):581–4. Brooks SC, Potter BT, Rainey JB. Treatment for partial tears of the lateral ligament of the ankle: a prospective trial. Br Med J (Clin Red Ed) 1981;282:606–607. Clark BL, Derby AC, Power GRI. Injuries of the lateral ligament of the ankle. Conservative versus operative repair. Can J Surg 1965;8:358–63. Drez D, Young JC, Waldman D, et al. Nonoperative treatment of double lateral ligament tear of the ankle. Am J Sports Med 1982;10:197–200. Kaikkonen A, Kannus P, Ja ̈rvinen M. Surgery versus functional treatment in ankle ligament tears: a perspective study. Clin Orthop 1996;326:194–202. Lynch SA, Renstro ̈m AFH. Treatment of acute lateral ankle ligament rupture in the athlete: conservative versus surgical treatment. Sport Med 1999;27(1):61–71. Trevino SG, Davis P, Hecht PJ. Management of acute and chronic lateral ligament injuries of the ankle. Orthop Clin North Am 1994;25(1):1–16. Brostro ̈m L. Sprained ankles: surgical treatment of ‘‘chronic’’ ligament ruptures. Acta Chir Scand 1966;132:551–65. Cass JR, Morrey BF, Yoshihisa K, et al. Ankle instability: comparison of primary and delayed reconstruction after long-term follow-up study. Clin Orthop 1985;198:110–7. Chrisman OD, Snook GA. Reconstruction of lateral ligament tears of the ankle: an experimental study and clinical evaluation of seven patients treated by a new modification of the Elmslie procedure. J Bone Joint Surg 1969;51-A:904–12. Dockery GL, Toothaker J, Suppan RJ. A lateral ankle stabilization procedure utilizing the peroneus brevis and peroneus tertius tendons. J Am Podiatr Med Assoc 1977;67:891. Elmslie RC. Recurrent subluxation of the ankle joint. Ann Surg 1934;100:364–7. Evans DL. Recurrent instability of the ankle: a method of surgical treatment. Proc R Soc Med 1953;46:343 – 4. Hedeboe J. Johannsen A. Recurrent instability of the ankle joint-surgical repair by the Watson-Jones method. Acta Orthop Scand 1979;50:337–40. Palladino SJ, Smith SB, Jackson JL. Plantaris tendon reconstruction of the lateral ankle ligaments. J Foot Surg 1991;30:406–13. Yu GV, Lynn JA, Thornton D, et al. The split peroneus longus lateral ankle stabilization procedure. J Foot Ankle Surg 1994;33:298–313. Kashuk KB, Landsman AS, Werd MB, et al. Arthroscopic lateral ankle stabilization. Clin Pod Med Surg 1994;11:407–23.